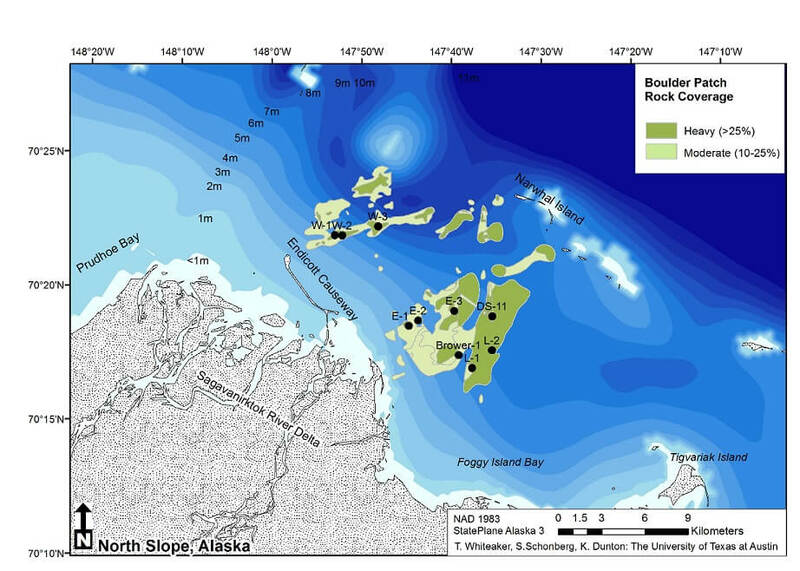 Although the seabed of the Alaskan Beaufort Sea coast is largely composed of silt and clay sediments, isolated areas of hard rock bottom occur along the coast. The boulders, cobbles, and pebbles contain mineral types not found elsewhere in northern Alaska, but matches that of rock outcrops in the Canadian Shield, suggesting they may have been transported from Arctic Canada during the last glaciation. The largest of these areas, known as the Boulder Patch, is located in Stefansson Sound and covers approximately 80 square kilometers of seabed. The rocks provide a solid substrate for a robust, colorful, and diverse community that includes kelp, red algae, and fauna such as sponges, corals, sea anemones, mollusks, bryozoans, and sea squirts. The Boulder Patch was originally mapped by geologists from the U.S. Geological Survey in the late 1970’s, but this map has been refined several times as more geophysical data became available. The bottom substrate varies widely across the Boulder Patch, from patches of bare mud to areas with 100 percent rock cover. "Then I saw the colors - startling bright pink soft corals, stalked flowers with drooping egglike clusters, waving feathery red tentacles of anemones, pale horns of the trumpet sponges - all clinging to a cluster of boulders and smaller cobblestones which were covered with silt covered kelp fronds"